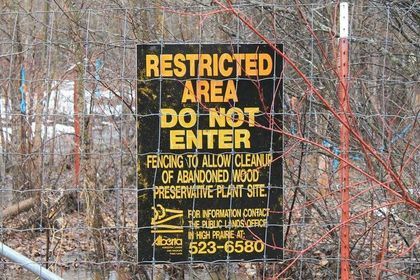 A former wood-preserving site along Lesser Slave Lake in Alberta is contaminated with arsenic, dioxins, and PCBs in excess of Alberta’s guidelines for parks and natural areas. With the previous owner of the property long gone, the Alberta government is left with the task of remediating the property. The current proposal by the government is to cap the site and turn the adjacent land it into a park. The site is located in Big Lakes County, near the town of Faust and along the southern shore of Lesser Slave Lake, approximately 300 km north of Edmonton. The Osmose Wood Preservers plant operated at the site from 1963 to 1969 using pentachlorophenol (PCP), chromated copper-arsenate (CCA) and related products, including diesel and/or fuel oil. In 1969, a fire destroyed the retort building; however, sawmill operations continued on the remainder of the site until 1973. Environmental investigations conducted at the site from 1989 found that the site soil and groundwater had been contaminated by the above-mentioned products and their degradation by-products. In 1993, the core of the site was excavated and the most severely contaminated soils (315 m3) were removed and transported to a landfill. The site is currently owned by the Government of Alberta. In 2014, the Government of Alberta acknowledge that further environmental work would be required at the site to ensure that ecological and human receptors would not be impacted by the contamination originating from the site. A 2015 engineering report done for the province found contamination remained, although it is declining with the years and has mostly been spread by dust from road traffic. Still, the report said, about 20,000 cubic metres of contaminated soil remained to an average depth of four metres on the 16 hectare site. The government is still working out the budget for the proposed remediation and a final decision on clean-up has not been made.